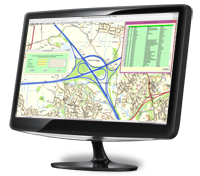 AbLoads software processes 750,000 abnormal load notifications submitted by hauliers, plant operators and crane companies each year. AbLoads is totally unique and comprehensive specialist software and processes more notifications than any other system. An experienced operator can process, check and respond to 185 notifications each day. AbLoads performs a uniform & secure check of every bridge along the abnormal load route for specific axle loads and spacings. AbLoads also incorporates traffic management if required and notifiers informed of restrictions directly via email. AbLoads also incorporates traffic management and notifiers informed of restrictions. 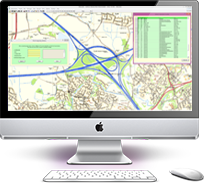 AbLoads has a suite of standard reports available covering hauliers, bridges and movements. AbLoads needs no separate email or fax software: it comes with its own self-contained components to receive and display both kinds of messages. This quality product is a vital asset in efficiently processing the ever increasing volume of abnormal load notifications that I receive, and here at Aone+ I would not be without it.